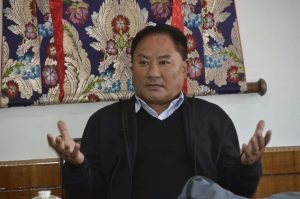 Dharamsala: The Speaker of Tibetan Parliament-in-Exile, Pema Jungney, being invited by Dhundupling Domey Association as a special guest, is attending the 30th death anniversary prayer ceremony for His Holiness the 10th Panchen Lama. The Speaker is departing from Dharamsala to Dehradun on 25 January 2019 and will be attending the prayer service on 26 January 2019. He is scheduled to return on 27 January 2019.